Discounting SPIDER-MAN, VENOM is the first of the Sony Pictures Universe of Marvel Comics. The filmmakers ensure that there is some brand distinction from the Warner Brothers (DEADPOOL, BATMAN vs. SUPERMAN) and Disney (THOR, IRON MAN) Marvel collaborations, so it is of no surprise that VENOM comes out like a hybrid of the existing Marvel action hero or anti-hero films. VENOM is quite good and more to come would be welcome. Ruben Fleischer who made ZOMBIELAND, makes a clear stamp in VENOM, which in truth is a horror story. There is an alien parasite than inhabits the host, our hero and a nasty one at that – a shapeless gelatine blob looking like black jello gone bad. Shot in both New York City and San Francisco, director Fleischer makes sure the audience is reminded of the filming locations. There is a scene where the infected Eddie Brock freaks out on a cable car ride. There is an elaborate chase involving cars and a motorcycle compete with special effects that is reminiscent of one of the best car chases in film history – Peter Yates’s BULITT. What makes the car chases in past films stand out is their continuity. This is missing in VENOM’s vehicle chase, but it is still pretty impressive. Tom Hardy, the English actor who has proven his acting chops in LOCKE and LAWLESS and who has been in everything from DUNKIRK, INCEPTION to the MAD MAX reboot is a perfect choice for the antihero. In plain clothes, he is Eddie Brock, the TV reporter who has a hot show ‘The Eddie Brock Report’ who wants to do the right thing and expose the very bad people. One of these bad people happens to be Drake (Riz Ahmed) of Life Enterprises who has just brought back parasites from outer space. Drake has a weird and unbelievable (but, hey, this is a comic book film) plan of bonding human and parasite to inhabit outer planets when Earth fails. Trouble is the humans and parasites do not match and the humans die. But Brock makes a good fit. Brock has a girlfriend, Annie (Michelle Williams) who help him when he is infected. VENOM is largely harmless entertainment. The monster does possess an enormous tongue, which the filmmakers cannot deists but use in a kissing scene. 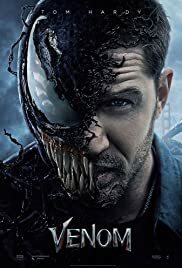 VENOM contains lots of brilliantly executed action scenes all with pyrotechnic explosions and special effects combined. Comic and action fans should be content. There are also some crazy scenes, like the one Eddie, when first infected dunks himself in the lobster tank of a posh restaurant and starts munching on the raw crustaceans. Williams and Hardy make good romantic chemistry. Hardy is sufficiently versatile enough to pull off a crazy anti-hero performance, in fact one of his best. Riz Ahmed, one of my favourite actors makes a sufficiently sinister villain. Stan Lee makes his usual cameo appearance. Audiences are advised to stay right to the end of the closing credits as there is a last surprise scene involving VENOM. VENOM is an entertaining enough action hero movie and one should be eager for the next instalment.